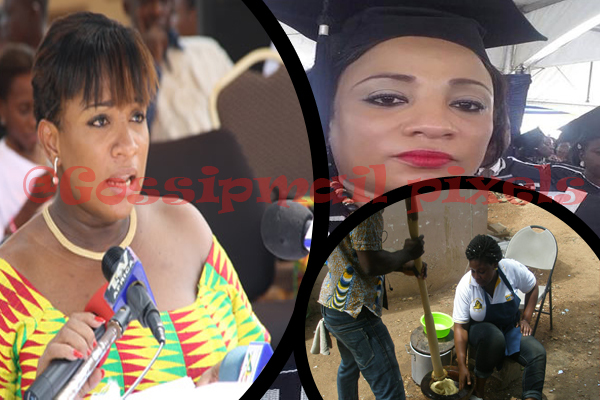 The newly wedded former minister of information under late President Atta Mills and former diplomat, Sabah Zita Benson formally know as Zita Okaikoi has fired back at a journalist who reported that she is now operating a chop bar. According to her, the video on which the report was made was put on her own WhatsApp profile yet the reporter painted the picture as though he/she captured the video. She was with the view that even if she becomes a chop bar operator, it will definitely be better than being a lazy journalist. I put this video of myself preparing fufu for myself on my what’s up status. The lazy journalists in my contacts, as usual, picked it up and gave it a lazy headline that I am operating chop bar. I don’t mind at all operating a chop bar. In fact, some of the rich people in this country are chop bar operators. I would rather be a chop bar operator than be a lazy journalist. If they want real work to do, they shd go to the banks n see which bank is coming down next. I love cooking, and the only time I will stop cooking is when I die. So they caption it any way they like.